Our clean air campaign, Reclaiming Streets, is all about getting safe air into our lungs. The campaign, which was voted for by a group of residents at our ‘Clean Air Café’ in September 2017, aims to re-prioritise road space in favour of people - for walking, cycling and communal activity - ultimately moving towards greater pedestrianisation and healthier streets. Vehicle emissions are the major source of air pollution in Tower Hamlets. We are currently working with the community in and around St Paul's Way to host a street party in June. We'll be aiming to close the road to traffic for one day, come along and find out what it looks like! Please get in touch if you'd like to get involved or find out more. In the long term, we want to work with local residents to identify how reducing traffic on St Paul's Way could achieve a measurable reduction in air pollution in the area while promoting community activity and wellbeing. This may include interventions ranging from greening to traffic-free zones near schools. 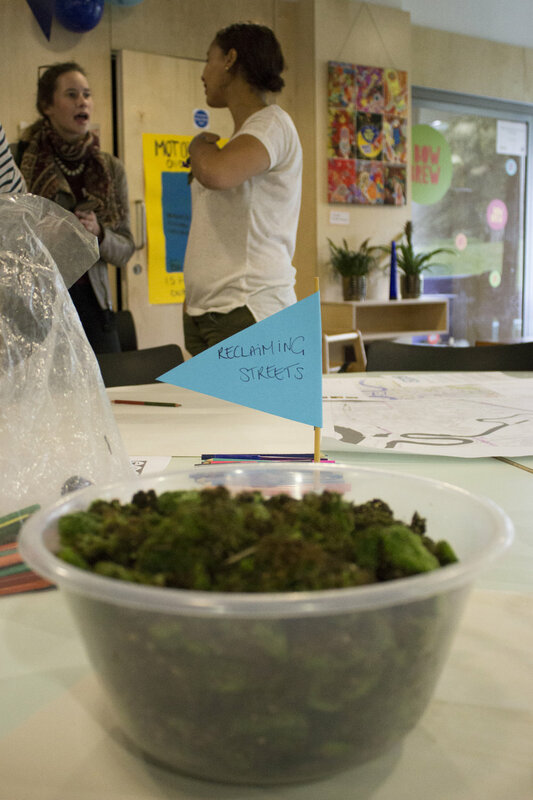 Anyone can get involved in the Reclaiming Streets campaign. You can get involved by attending our planning meeting and share your ideas for creating a healthier street environment for all. Reclaiming Streets is a partnership between Friends of the Earth Hackney and Tower Hamlets, Poplar HARCA and Our Air Our Health... and hopefully many others in the future! Why are we concerned about air pollution? It's a danger to our health...: air pollution has been ranked 2nd only to smoking as a cause of premature deaths, and nearly 9,500 people die early each year due to long-term exposure to air pollution. Across the UK, it is believed more than 50,000 people a year die prematurely as a result of air pollution. ... particularly children and the elderly: Vulnerable groups, such as children, the elderly, and people with existing respiratory illnesses suffer disproportionately. Shockingly, 75 out of 126 schools in Tower Hamlets are within 150m of illegally toxic air, including the most polluted school in London - the Courtald Institute of Art. You can find out more here. Air pollution is a huge social inequality issue, with the poorest areas often suffering the worst air quality. Several areas of Tower Hamlets exceed EU limits of NO2 by more than double. And there are economic effects - the World Health Organisation estimates the UK suffers £54 billion in costs associated with air pollution annually. On Saturday 9th September we held a 'Clean Air Cafe' to ask local residents what they thought we should be doing to tackle air pollution - and they voted for 'Reclaiming Streets', a fantastic campaign on reprioritising roads towards people and sustainable transport. You can see more about how we and our partners, Our Air Our Health and Poplar HARCA can developed Reclaiming Streets above! And you can join our next event on 31st January if you'd like to get involved. Working with members of the local community, as well as councillors and Council Officers, we have submitted a detailed response to the draft Air Quality Action Plan in collaboration with Our Air Our Health. You can see the full table of amendments and recommendations here, and a summary of our response here. Major John Biggs (@MayorJohnBiggs) is the ultimate decision-maker on the plan, so let him know what you think! We have written to Mayor Biggs encouraging him to make sure the plan is given the high priority it needs to have an impact. We have also requested that members of the community can get involved in overseeing the implementation of the plan. In the most recently reported NO2 results for Tower Hamlets, 62% of monitoring sites exceeded safe, legal limits, and 15% significantly exceeded air quality objectives. It is vital for the health and well-being of residents of Tower Hamlets that the new Air Quality Action Plan. We've taken action to oppose the Silvertown tunnel - a new river crossing near the Blackwall tunnel. We recognise the series issues that congestion at the Blackwall tunnel is causing to the health of people living near to it. But we're concerned that the assumptions underlying the proposed new Silvertown tunnel are not sound, and that it will not positively benefit people in Tower Hamlets and other affected boroughs. In late 2016 we asked people to write to the Mayor of Tower Hamlets, John Biggs, if they shared our concerns, which people did. We also got some media coverage in East End Citizen. We also took an active role in the planning process - if you would like to see our latest Written Representation published on the National Infrastructure Planning website here. You can see the main overview page for more information about the planning process. Locally, we've been engaging with Tower Hamlets' new Local Plan - you can see our response here. There will be further consultation on the Local Plan in Summer 2017 - look out for how you can get involved nearer the time. You can sign the petition to ditch diesel here, and you can you order your very own clean air kit here! Does it affect climate change? Yes. Black carbon, a kind of particulate matter emitted especially from diesel vehicles, absorbs solar radiation and so has a warming effect. The UN Environment Programme (UNEP) believes tackling air pollution could help cut global average temperatures by 0.5ºC, which could be crucial in the fight to keep temperatures from rising more than 1.5ºC above pre-industrial levels. Any substance concentrated enough in our air to have harmful effects could qualify as air pollution. There are many harmful gases - sulphur dioxide, carbon monoxide, ozone, etc. - but in Hackney and Tower Hamlets, concern is focussed mainly on nitrogen dioxide (NO2) and particulate matter (PM), particles so small that they act effectively as a gas. Although there are many sources, including construction, industrial activity and heating, the main source of both NO2 and PM is ground-based transport. NO2 inflames the lungs, stunting their growth and increasing the risk of respiratory diseases such as asthma and lung cancer. PM10, referring to particles less than 10 microns (millionths of a metre) in diameter, can accumulate in the respiratory system and can result in a number of health effects ranging from coughing and wheezing to asthma attacks, bronchitis, heart attacks and strokes. PM2.5, particles less than 2.5 microns in diameter, can enter the cardiovascular system, with a range of adverse health impacts.